Charlie Daniels' late penalty earned Bournemouth a third successive Premier League victory at the expense of West Brom, who finished with nine men. The Baggies were a man down in the 34th minute when James McClean was shown red for scything down Adam Smith. The Cherries took the lead when Smith fired in low from 20 yards before Gareth McAuley equalised with a header. The result sees manager Eddie Howe's Cherries stay 14th in the table, although they are now only two points behind 13th place West Brom who have 20 points. Relive the action from the Hawthorns. Results and reaction from Saturday's other Premier League matches. The opening 30 minutes was rather tepid. The contest took a turn for the better - although Baggies fans will disagree - when McClean was shown a straight red by referee Mike Dean for a challenge on Smith. Cue the expected Bournemouth charge. The Cherries were already on top but having a man advantage gave them that added fillip to go and attack their hosts. The goal came seven minutes after the break when Smith collected a crossfield ball from Andrew Surman, cut in from the right before slotting into keeper Boaz Myhill's bottom left. Then came an unexpected twist. The Baggies had posed little threat on the rare forays into the final third, so when McAuley headed in off the post from a corner, even the home fans inside the ground seemed surprised. Although the Baggies did not have their finest 90 minutes this season, they would rightly feel aggrieved for the penalty decision in the 87th minute. 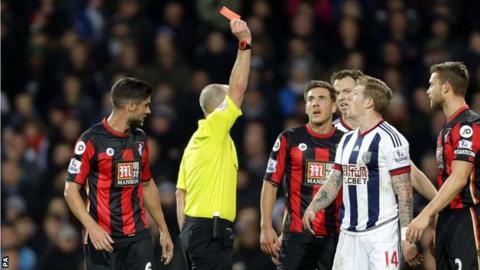 Dean, subjected to some jeers for sending off McClean, was adamant Gosling had been fouled inside the area by West Brom skipper Darren Fletcher. However, the TV replays seem to suggest that the infringement occurred outside the area. Daniels, unaffected by the plastic bag that floated near the penalty spot, confidently blasted his kick past the reach of Myhill. The £12m club-record signing had a day to forget. Bar a spectacular volley early in the second half, the Venezuela international was largely ineffective as a lone frontman. Then came the sending off. With his side heading for defeat, Rondon went face-to-face, or should that be head-to-head with Gosling. The forward then thrusted his forehead at the Cherries midfielder which referee Dean judged to be a red-card offence. That will be a three-match ban for Rondon, while McClean will also get a ban which will give manager Tony Pulis a headache over the busy festive period. Bournemouth boss Eddie Howe: "Whenever you come here, to get three points, under the conditions you are faced with, it is a huge three points and take nothing away from the lads. "The fact it was against 10 men doesn't really change their threat from set pieces. It is a great win for us. It was hard to create chances first half - anyone who sees us consistently will say we are a side that creates more chances than today. "Personally I thought it [McClean] was a red card. They came together just seconds before that tackle and James just lost his head a little bit and seemed to go over the ball from my angle so I wasn't surprised when the red card came out. "It [Rondon] was a silly one really. Both players came together and I'm pleased my lads kept their cool and control. The referee had a very good view is what I'll say." West Brom boss Tony Pulis on the penalty decision: "I think everybody can see it's outside the box. It's really disappointing, you can't be giving big decision unless you're absolutely 100 per cent sure. He's an experienced referee and it's very disappointing. "The reaction of the players when Mike Dean gives the penalty, they were absolutely distraught. It's not a penalty. We've worked very hard second half with 10 men." Tony Pulis has suffered his 100th Premier League defeat, a figure only 14 other managers have reached in the competition. Bournemouth have seen their opponents pick up five red cards this season in the Premier League; more than any other side. Smith has scored two (both from outside the box) in his last four league games for Bournemouth after netting just one in his previous 86. WBA have scored a league-high eight headed goals in the Premier League this season. The Cherries have shipped a league-high 12 goals from set-piece situations this season. The Baggies travel to strugglers Swansea on Boxing Day, while the Cherries are hosting Alan Pardew's Crystal Palace on the same day. Match ends, West Bromwich Albion 1, Bournemouth 2. Second Half ends, West Bromwich Albion 1, Bournemouth 2. Salomón Rondón (West Bromwich Albion) is shown the red card for violent conduct. Attempt blocked. Salomón Rondón (West Bromwich Albion) left footed shot from the centre of the box is blocked. Assisted by Rickie Lambert. Attempt saved. Adam Smith (Bournemouth) right footed shot from outside the box is saved in the bottom left corner. Assisted by Marc Pugh. Substitution, West Bromwich Albion. Saido Berahino replaces Darren Fletcher. Attempt saved. Marc Pugh (Bournemouth) right footed shot from the left side of the box is saved in the bottom left corner. Assisted by Dan Gosling. Foul by Tokelo Rantie (Bournemouth). Goal! West Bromwich Albion 1, Bournemouth 2. Charlie Daniels (Bournemouth) converts the penalty with a left footed shot to the top right corner. Penalty Bournemouth. Dan Gosling draws a foul in the penalty area. Penalty conceded by Darren Fletcher (West Bromwich Albion) after a foul in the penalty area. Corner, Bournemouth. Conceded by Craig Dawson. Attempt missed. Craig Dawson (West Bromwich Albion) header from the centre of the box is close, but misses to the left. Assisted by Craig Gardner with a cross following a set piece situation. Rickie Lambert (West Bromwich Albion) wins a free kick in the attacking half. Attempt missed. Matt Ritchie (Bournemouth) left footed shot from outside the box misses to the right. Assisted by Andrew Surman from a direct free kick. Attempt missed. Harry Arter (Bournemouth) left footed shot from outside the box is high and wide to the left. Assisted by Andrew Surman with a headed pass. Goal! West Bromwich Albion 1, Bournemouth 1. Gareth McAuley (West Bromwich Albion) header from the right side of the box to the bottom left corner. Assisted by Craig Gardner with a cross following a corner. Corner, West Bromwich Albion. Conceded by Charlie Daniels. Substitution, Bournemouth. Yann Kermorgant replaces Glenn Murray. Substitution, West Bromwich Albion. Rickie Lambert replaces Chris Brunt. Corner, West Bromwich Albion. Conceded by Glenn Murray. Offside, Bournemouth. Harry Arter tries a through ball, but Charlie Daniels is caught offside. Corner, Bournemouth. Conceded by Jonas Olsson.